Clinton played for the Iowa Hawkeyes in 2002, 2004, and 2005. He piled up 1864 yards on 118 receptions and 14 TDs over his 3 years there. His best season came as a Junior when he logged 58 receptions for 905 yards and 6 TDs- earning him 2nd Team All-Big Ten Honors. Going undrafted, Solomon signed with the St Louis Rams in 2006. Afterwards he was on the rosters of the Titans and Bears in 2007. 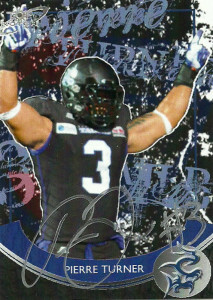 He signed with the Arena Chicago Rush in 2008, and finally found his home with the Wichita Wild of the IFL in 2009, where he was named 1st team All-IFL after posting 22 TDs and 1,008 yards receiving. 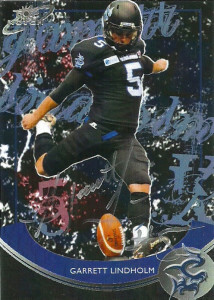 He again earned All-IFL selections in 2010 and 2011. 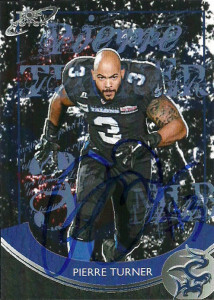 Clinton spent then next two seasons with the Sioux Falls Storm, and briefly played for the Kansas City Renegades. In 2014 Clinton joined the Texas Revolution. Soon thereafter he’d be signed by the snake bitten San Antonio Riders of the AFL. After the season the Talons were contracted, but he was assigned to the Las Vegas Outlaws. After the Outlaws were also contracted, Solomon returned to the Texas Revolution in 2016 reuniting with former Talon Brett Reece. Clinton finished the season as the team leader with 63 receptions for 793 yards and 25 TDs. A few years ago I had started tracking down members of the Talons who I had made cards of. I attempted to friend Clinton on Facebook, but he did not respond to me for over a year. I reached out to him when he did and he agreed to do a signing for me. Apparently he was more excited than I intially thought, because after he signed the card, he also inscribed the back of the envelope thanking me for the trading cards.